Alice no Toge piqued my interest mainly because of Ueno Juri’s return to drama after 3 years. It’s also notable that she has never been given a professional job before in movie/drama, so this time, as a doctor, I’m more than excited. However, if you think this is a medical drama, it’s not. Don’t let the theme fool you. This is a revenge drama. It’s filled with suspense and some thrilling moments. I have to admit that I’m more than impressed with the pilot episode. The pace, the plot, characters were just right. Perhaps, the pace was faster than I thought but that just adds to the unpredictable nature of this show, which is one of my favorite things about it. 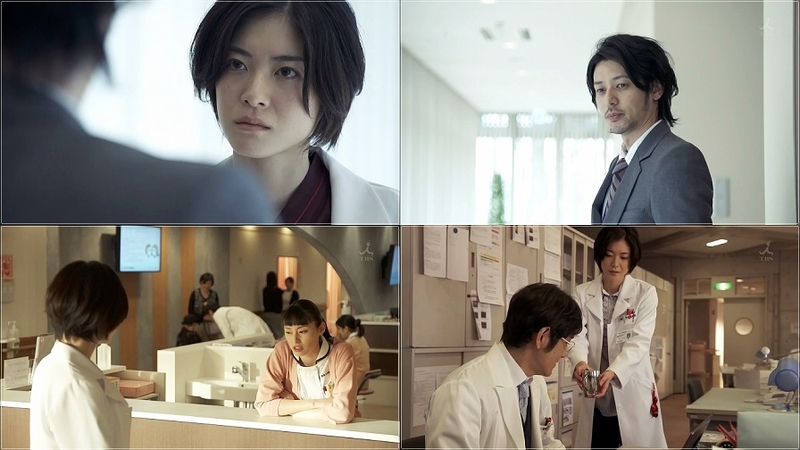 In the first episode, we already saw Asumi took revenge on 2 people who were involved in her late father’s medical error. We also noticed that there’s a pattern – every person will shift the blame to another person, so this leads her to a number of people in the hospital. With the pace, I’m intrigued to see how the plot will hold. I mean, in the first episode, she already took care of 2 people (one of whom I thought will last longer than an episode – yes, Date Sensei), but the screenwriter slapped me right there and then when they wrote her off at the end of it. She’s no longer featured in Ep2 as her character was forced to resign. but fear not…I suppose the screenwriters must have some kind of plot for the rest of this show. As usual, we get an insight of Chihara’s habit. He’s a doctor focused on research and doesn’t care about the patients. In operating rooms, he usually just cuts the patient and leaves the rest to his assistants. Asumi noticed this and upon more observation, she realized he’s keeping a secret. He has some eye disorder and that makes him incapable of holding a scalpel, let alone, operate on someone. We also see Asumi getting closer to Bandai’s son. He apparently also likes her for not making a fuss about his identity as the Professor’s son. At the same time, Asumi’s actions are at a risk of being exposed when Nishikado suspects her. He has since then been trying to approach Asumi, advising her not to go any further, but to no avail. I absolutely love all the scenes between Asumi and Nishikado. Ueno Juri and Joe Odagiri have so much screen chemistry! It’d never crossed my mind to have both appear on-screen together. There are just so much tension going on between the two – Nishikado’s regret for not being on Asumi’s side 15 years ago and Asumi’s wall of deep hatred that Nishikado’s trying to break through. There’s a good balance at least with some slice of life moments when Asumi returns home. Her daily interaction with her step-dad brings a breath of fresh air every once in a while especially when there’s so much tension. Her next target will be the lawyer, we’ll see how this goes. Will Nishikado be able to stop her before she actually kills someone? Bandai’s competitor, Arima has taken interest in Asumi. I think he’ll cooperate with her in the future to get rid of all those useless doctors under Bandai. This will of course be in favor of Asumi’s revenge. Another thing I really have to give Ueno Juri props is her mad face glare!!! Her expression and subtle changes are amazing. Actually, this kind of worries me a little. You know how there are some actors who lives the character just to get into the role in a more realistic way? They start living and thinking like the character they’re playing. I wonder if she uses the same style? We’ll never know but you have to watch Nodame Cantabile and then perhaps, Last Friends, you can skip Sunao ni Narenakute (even with Eita, the plot was just a disappointment). And then you watch this and realize the tremendous changes. I’ve always been confident that she’s a great actress. Perhaps, not as amazing as Hikari Mitsushima who is at the top of my list. But given the right role and plot, I’m sure she can do it. I just hope the plot doesn’t falter and head for a strong end with good ratings. Will she move towards the lawyer and how will she take revenge? Fuji TV is airing Gokuaku Ganbo which stars so many actors/actresses that I can’t be bothered to recall their character names. It’s one of those dramas with one lead and tons of other co-stars who may not play huge roles but they all come together to make a story. In this show, we have Kanzaki Kaoru. All you have to know about her is that her useless ex-boyfriend Kazuma caused the loss of their savings (which they dreamt of building a restaurant business) and landed them a 2 million yen debt. Not to mention, this useless ex-boyfriend disappeared and left Kaoru to deal with the guy they’re in debt with. Two guys came in at the same time and offered to settle her debt, alongside another girl’s. These guys belong to Koshimizu Management Consultant company. So now, Kaoru’s debt is settled but she’s forced to work for the company who helped her. Is this win-win position? Oh another thing is this show’s all about money or…yen yen yen! I have to thank Jdrama Weblog for the synopsis. It helps me to understand the show better, especially, without subs. This needs to be subbed though. I’m still spinning my brain cells around that marriage fraud, how could that earn them money? 1) Kaoru is too nice; helps the other girl pay when she’s having 2 million yen debt. This kindness can land her in more trouble in the future, which is true by the end of the episode. 2) Kaoru’s ex-boyfriend makes delicious potato salad. 3) Kinpatsu guy and cool guy look like they’re on good terms, I believe otherwise, they like to compete with each other. 4) Cool guy is the nicer employee in Koshimizu. At least, he doesn’t recommend shady jobs like Kinpatsu. 5) Kiriko (Naka RIisa) has a soft spot for cool guy and gets excited when he’s around. 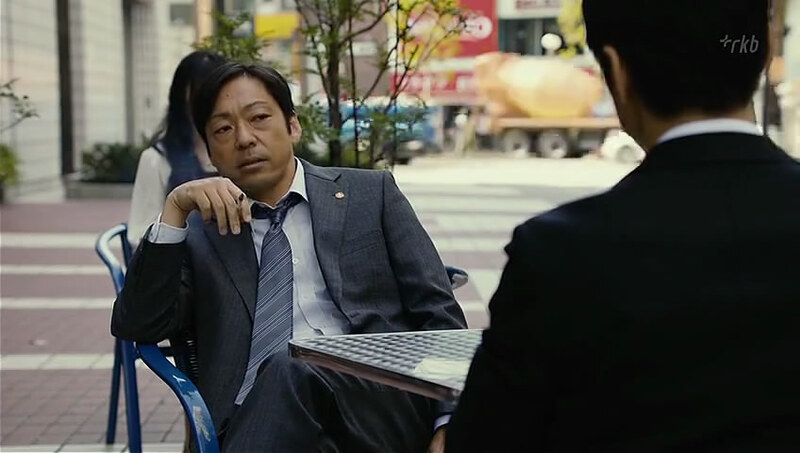 6) Cool guy is an ex-police officer and at times, asks help from Tamotsu (Joe Odagiri), his former subordinate. 7) Joe Odagiri! Yes, I didn’t know he’s in this too besides Alice no Toge. That last one was just my own excitement that I couldn’t contain. 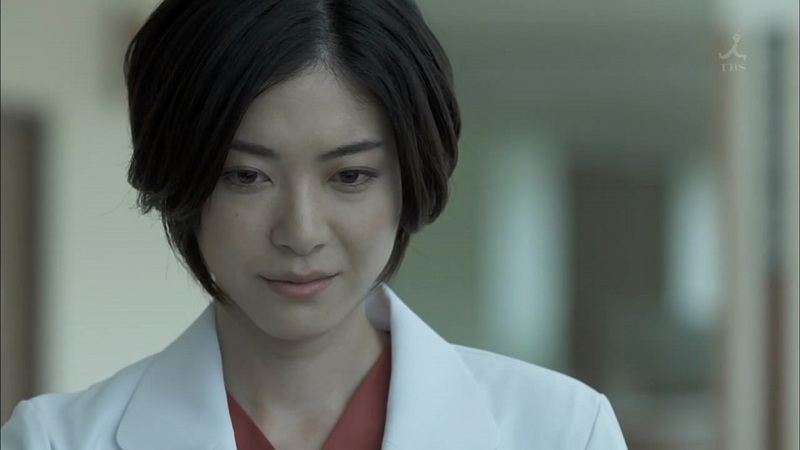 I’m happy to see Ono Machiko back in dramas, she’s amazing in Saikou no Rikon. To be honest, I gave this a try just because of her. I wanted to see how will her character fare in this, is it any different from Saikou no Rikon? Well, I don’t see huge difference but we do see a less sloppy person (or Eita’s character was just too hygienic), more independent, doesn’t falter too much when it comes to right or wrong…at least in the beginning. But when a person is saddled with 2 million yen debt, it’ll change the person, tremendously. We’re gonna see a cool Kaoru soon. I’m anticipating when she starts working in the underworld in the company xD As for the other characters, they’re all great so far. Though I wonder the significance of old Mr. President of the company who only appeared twice in the entire pilot. I will continue this just to see the various kind of fraud they come up with and how Kaoru pays back her debt. If you recall the Japanese remake of HK movie, Internal Affairs, by the name of Double Face, then you’d know the two lead casts in this show. Yes, from the same screenwriter of Double Face and both actors, Nishijima Hidetoshi and Teruyuki Kagawa star in this police drama. 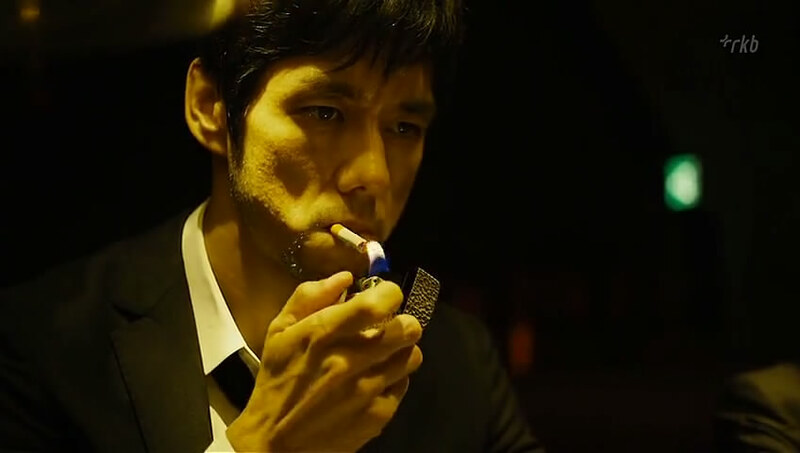 I’ve always liked Nishijima’s past dramas/movies. For some reason, he’s a perfect fit for being hard-boiled character, brooding eyes, dark and depressed roles. It’s no different in this, at least from what I’ve seen. In fact, he reminds me of his character in Double Face. 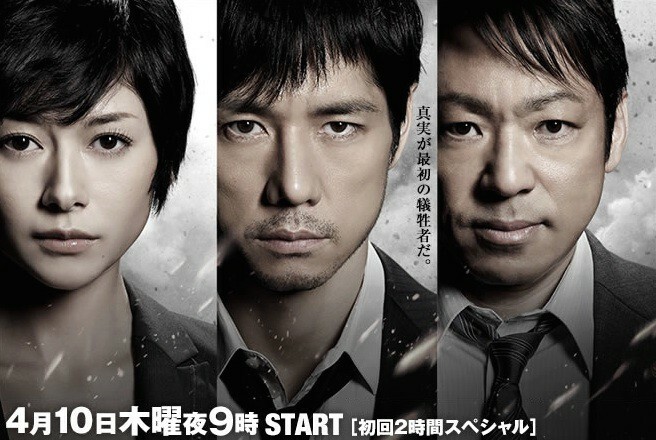 Nishijima plays the role of Inspector Kuraki from Public Security 1st division. His wife was killed in a bomb explosion. As for Teruyuki, he’s a veteran and I expect no less from him. 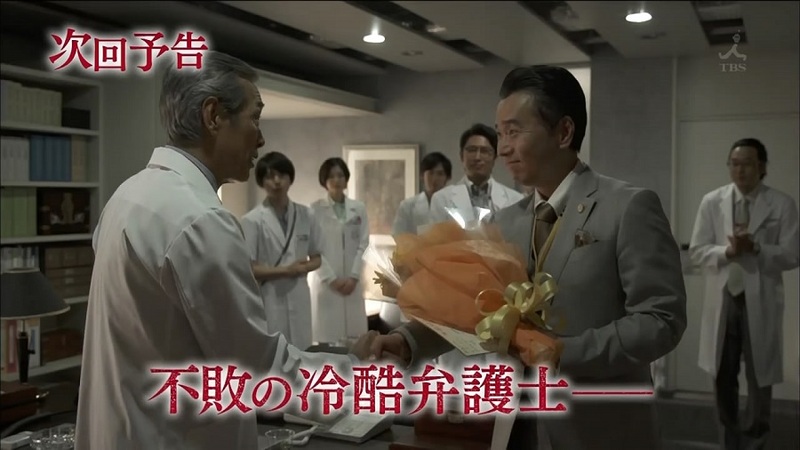 He gave such a great performance in Hanzawa Naoki as villain. Here, he plays Assistant Inspector Osugi Ryota who goes by the book kind of police and expressed his honest displease towards Public Security. 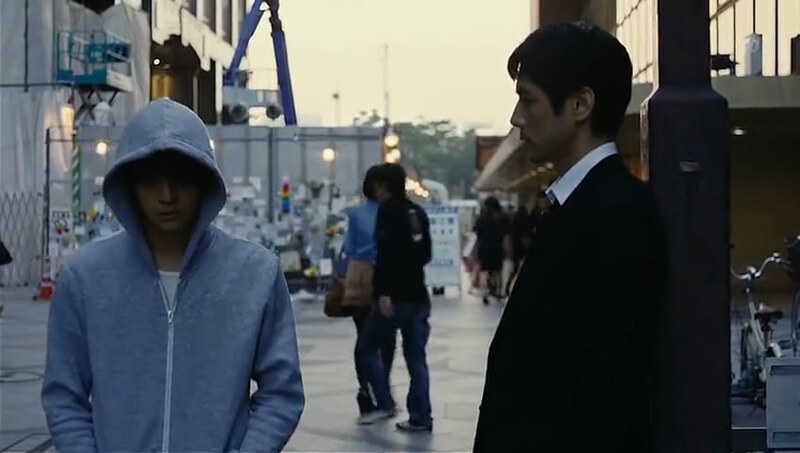 Hence, he’s already seen butting heads with Kuraki the moment they met. Lastly, we have Maki Yoko who acts as police officer Akeboshi Miki in Public Security 2nd Division. This pilot episode is 90 minutes long by the way. Miki was at the bomb incident when it occurred and therefore, Ryoto believes she may have seen the bomber’s face or know something about him. However, Miki insists that she knows nothing about the villain. 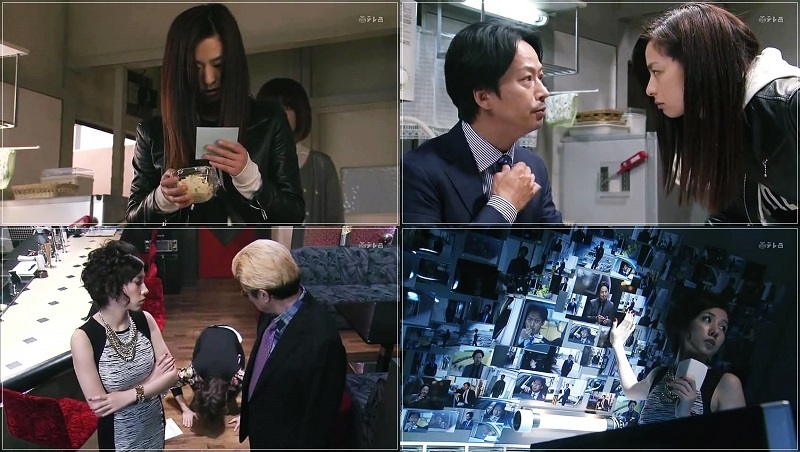 Ryota met Kuraki for the first time when he came to identify his wife’s body from the incident. 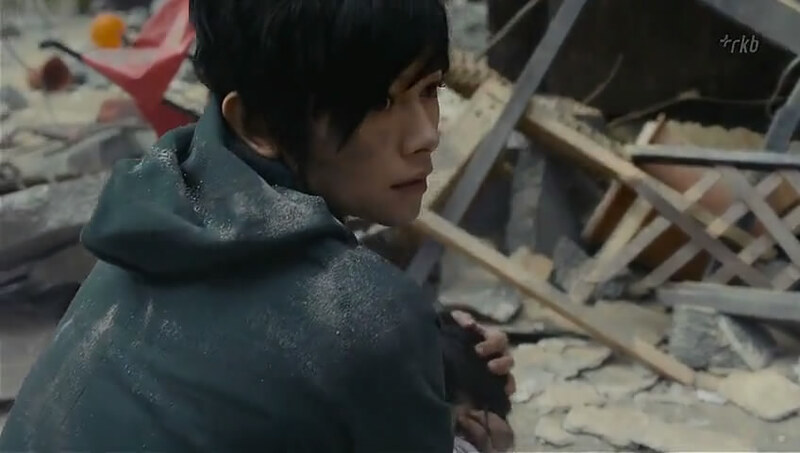 Kuraki showed a cold hard face even after identifying the wife, or what’s left of his wife. This made Ryota a bit taken aback. So it seems that Kuraki had a dark past within his family. Is that his daughter drowned? I just love Ryota in this show. I like how he distrusts Public Security as a whole and never ceased to show how pissed he is whenever dealing with Public Security. It’s funny and I am amused. Okay, what was the brief brawl about at the subway station between Kuraki and Miki? I actually thought they were going to kill each other. Miki revealed to Kuraki that she was tailing a man called Shingai and he was at the crime scene when the bombing happened. Somehow his whereabout is unknown after that. So there’s another side of the story on Shingai, the villain. Apparently, after a falling out within the gang he was in, he fell from the cliff and ended up injured, lost his memory. Kuraki opened up to Ryota about his daughter and wife. I find it haunting how he never knew whether his daughter’s death was accident or actually killed by his wife. His daughter was found drowned at the bath tub, with his wife sitting nearby. I guess since then their relationship has never been the same. Now I find it a bit odd how Kuraki opened up to Ryota, despite the fact they were aloof to each other, almost to the point of “I’d rather not see your face” kind of reaction. In that case, I’d rather the screenwriter not make him tell Ryota about the past, rather giving some hints or letting Ryota himself find out. 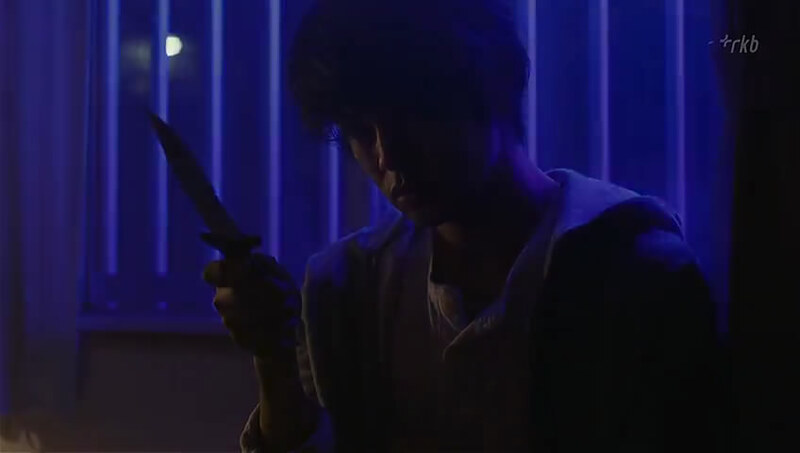 So at this point, it didn’t click with Kuraki’s character…but I guess now we know what happened in his family. Shingai couldn’t recall what he did and so this girl who helps people who lost their memory helped him. The gang then tried to kill him. Is it just me or I find the people Athena Security asked to kill Shingai are amateurs? You’d think of getting more experienced pros to kill a professional killer right? Also when Shingai’s eyes turned black all over, I don’t find it spooky (if that was the intention) but a bit annoyed. Are we supposed to think that he has some supernatural power now? So Miki can actually smile. She looks like a stone the entire episode I didn’t think she’d even crack a smile. This is long. It’s midnight now so my mind is challenged. First impression: It is as I expected it to be. Dark, moody, slow-paced, suspense police drama. It’s similar to Double Face really so I’m not disappointed. However I’m not super impressed as well. I just feel there’s not enough Ryota! Half of the episode is dedicated to Shingai’s side of story, we still don’t know whether he actually has a sister or not and he’s on the quest to find that out. I wonder how long can he keep himself out of danger with Athena Security and police chasing after him. So far, my fav character is Ryota. 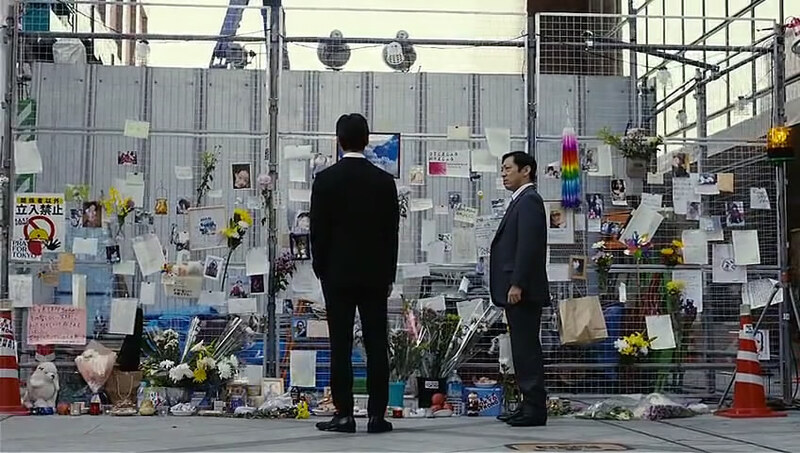 I tried to sympathize with Kuraki, he lost both wife and daughter, but, I just couldn’t, yet. 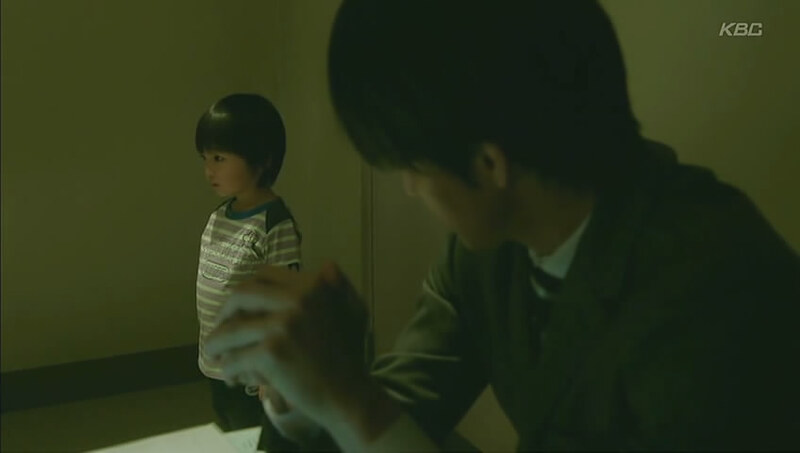 Is Nishijima’s role challenged by playing Kuraki? I find it very similar to the past roles so I don’t find it particularly different. Maki Yoko also showed the same hard face. I need to see more to judge. BORDER is a police drama at first glance but there’s more to it, I’ll say, supernatural? 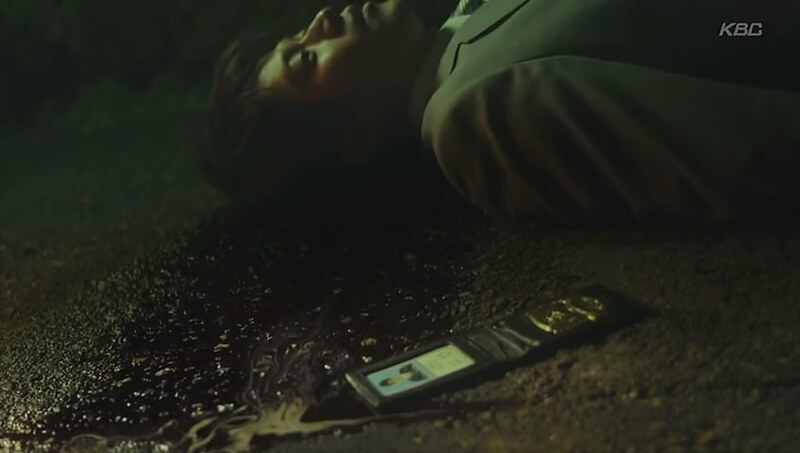 Oguri Shun returns as a detective, Ango Ishikawa, who was shot at a crime scene. As a result, the bullet was lodged into a difficult location in his head, making surgery complicated. So he decided to leave it there for the time being. Weeks later when he returned to work, thinking he could cope with the traumatic event of life and death, well, it’s not as simple. He thought he was just hallucinating when he saw a girl who was supposed to be dead at the hospital. He began to be able to see murder victims’ ghosts at crime scenes. I won’t go into details of the plot. However, SPOILER ALERT. While I like the idea behind this show and having a police able to communicate with victims’ ghosts…it’s not new actually. But if given the right script, this might work. The first episode’s mainly introduction. We know Ango doesn’t have girlfriend and dedicates his life and priority in work. He leads a dull life, will give anything just to work at crime scenes. We also meet this new female coroner who seems cold at first impression. But she’s as observant as Ango as well. So far, I’m not sure how this drama will proceed from here. I guess it’ll be a case to case scenario and with Ango’s newfound ability, be it a curse or gift, he will know who the murderers are as long as the victims make contact with him. With police dramas, I like it when there’s suspense and we get little clues here and there till the end where the villains are revealed. This one is the opposite. Ango knows the identity of the criminal and what is left for him to do is to search for clues and proofs. It somehow … takes away the excitement. Therefore, I didn’t find myself really enjoying the first episode. It doesn’t make your heart beat. The pilot episode didn’t thrill me as much because like I mentioned, the suspense is taken away when Ango can know the criminals’ identity from the get go. So I didn’t quite enjoy it. The pace is also…quite slow but perhaps, it’s only the first episode. We’ll see how it goes from here. I don’t find the significance of the coroner’s role yet. I hope she’s not just there to give moral support to Ango. I won’t be surprised if she’s the first to find out that Ango can communicate with ghosts. She already showed some inkling and suspicion towards him. The pilot episode got 9.7% rating. I think it’s alright. Let’s hope the screenwriter picks up speed and suspense in the next episode. Overall, I’m a bit underwhelmed. In fact, there were several moments where I wanted to fast-forward. News: The pilot rating for this show is 14.2% viewership. Mozu had 13.3% while BORDER had 9.7%. Seems like Alice is off to a great start! *I hope someone will pick this drama up for subbing. I watched the first episode without subs because I couldn’t wait. First of all, Ueno Juri is one of my fav J-actresses and it’s been ages since her last dorama. In fact, the last one she did was the taiga drama, Gou (2011). So it’s really nice to have her in a regular drama again. Secondly, there’s Joe Odagiri. I don’t really watch his stuffs but from all of what I’ve seen, they seem to be pretty good. 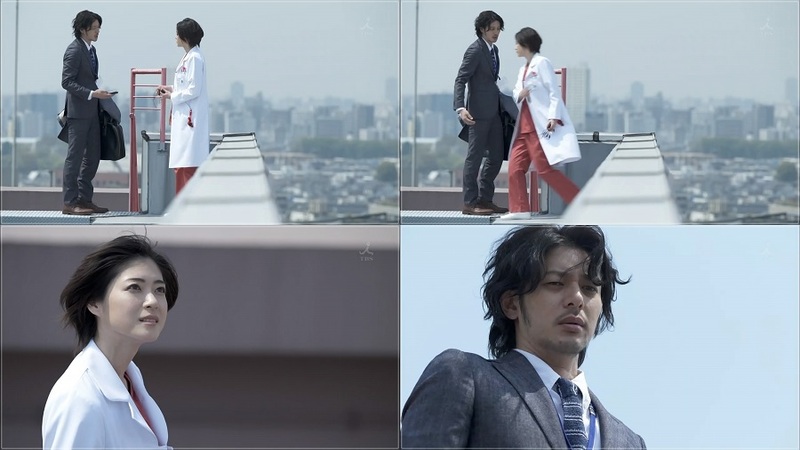 Hence, having both Joe and Juri in one drama, it’s hard not to give it a go! This is just a brief review/recap of the episode, I won’t go into details but just what I think. Ueno Juri plays the lead named Asumi Mizuno whose father, a doctor in Seirin University Hospital, died during an operation 15 years ago. She then embarked on a journey to investigate the truth about his father’s death as she believes something was not right. Basically, she studied to become doctor and joined Seirin. She found two different records of her father’s operation report and obviously, someone changed it indicating medical error. I love how this first episode went. I like the fact that her character was so dark and they didn’t wait till the end to show it. In fact, 10 minutes in, they already showed where she lives, the shabby studio-like apartment, and her secret den. She’s got all pictures of the suspects pinned up on one side of the wall. Tonnes of record files for each of the suspect. The first suspect she went after was the guy above. I like the reference of Alice in Wonderland and the Humpty Dumpty lol…I bet they chose him just because he’s bald. Didn’t take her long to move in to Humpty Dumpty. Guy tried to remove some on the side of the wall of the building, climbed down the rope ladder, giving her the perfect opportunity to threaten him. She said it’s been 15 years since the father’s death…she changed her name, threw away everything else and focused on chasing down the culprits who killed her father. Upon threatening Humpty Dumpty, he gave in and revealed everything. He promised to help her in her mission…so she got herself a spy within the society. Next target is this Date sensei. Basically, she’s pushing this new technology called NOA. She found a perfect ‘mouse’ or patient for the system and despite Asumi’s doubt, she brushed her off saying ‘patients are meant to be mice for doctors’…that obviously, pissed Asumi lol. 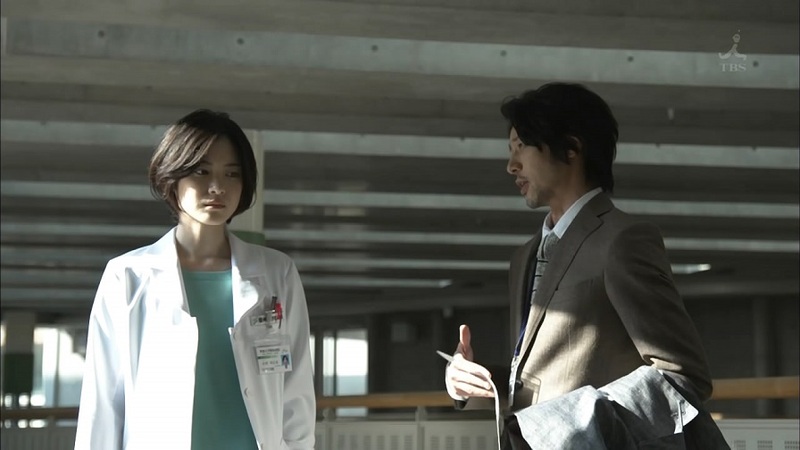 Midway, we’re introduced to Joe Odagiri’s character, Nishikado ^^ He’s a journalist and met Asumi at the hospital grounds one day. He seems to have taken interest in her. I’m not sure what relationship he had with her in the past, but in the flashback scene, it looked like he could be someone she knew. I love how they used slow-mo shots here. The uh…’bokehness’ as well. The cinematography for this drama is good! He knew Asumi’s father because we saw in the flashback, they were sitting under the sakura tree, eating together. It is revealed that Asumi has been adopted by another person, who owns a diner. While having dinner one night at her stepdad’s place, she met Nishikado again. She tried not to make much contact with him but he was making conversation with her. Nishikado mentioned he came here a lot in the past with her younger sister. I wondered if Nishikado’s sister was once Asumi’s father’s patient, hence the flashback where they were sitting together. Nishikado was surprised that the chef is Asumi’s father and said they’re not alike at all. So when her stepdad tried to explain to him and was pointing to the picture on the wall of Asumi and her real father…Asumi quickly pushed the wine glass onto the ground. That was a close call. She didn’t want Nishikado to know who her real father was. But that didn’t stop Nishikado from suspecting something. For some reason, Asumi tried to get close to this guy below. Oh wait, did a little research. He’s Bandai’s son. Bandai is a higher-up Prof I think. Her next target as mentioned above. Asumi planted a fake flower delivery to her, which released fake smoke at her apartment and when the fire department called, Date rushed home. Asumi then took the opportunity to explain to the patient she was trying to get for NOA system about the operation. She never mentioned anything about NOA to the patient so basically, the patient signed for the normal operation instead of NOA. This caused the Date to lose the patient for NOA. However, due to the support from the higher ups, the Date still managed to push for the NOA tech. She needed to prove the system in order to become Professor. I can’t understand in detail but it seemed like her father was framed for some crime after death. Young Nishikado (the guy below) showed her the newspaper clip at the funeral about her father. This guy below, Bandai (higher up Professor who supports the NOA sensei) told her that her father is ‘kuzu’ or ‘society trash’ at the funeral. Wow…just wow…whatever it is, you don’t say stuffs like that during a funeral. That was hurtful even to me as a viewer, can you just imagine how that feels to a young girl? Asumi trying to plot something against Date. I don’t think I’ve mentioned that Chiaki Kuriyama is also in this drama. She was in Team Batista drama last season, have yet to watch the finale of that drama. Well, she plays a nurse here. Not much screentime yet but we’ll see how significant her role will be in the future. Asumi knew Date was tampering with the patient’s record so she tried to get data from her computer at home. After some ruckus with the fake cake delivery and some gas, the guests rushed out. However, when she tried to transfer data from the computer, the Date’s fiance caught her in the office. Now we’re thinking she’s gonna get exposed right? Well…apparently, Date’s fiance acted like nothing happened afterwards and Asumi got away. At this point, we don’t know what occured between her and Date’s fiance. During the conference for NOA patient, the records were different from those shown on slide and the handouts. Everyone was shocked that Date said she can finish this operation within 3 hours. However the real record showed otherwise. I like it when Asumi has this subtle smile whenever her plan goes as planned. Date’s fiance appeared. So now we know that Asumi told him the truth about Date. He does not approve of Date’s doings. Nishikado was there too for the press briefing. Prof Gendai was pissed with Date and Asumi is winning at the moment. Date then confessed to the mistake but also blamed it on another doctor who was there. So I guess…we’ll see how Asumi goes for the others in the next episode. Poor Date got her tummy tattooed with Asumi’s father’s name. This is SUCH A GREAT FIRST EPISODE! I am officially more than impressed. I didn’t expect Asumi’s character to be this dark and twisted. Ueno Juri does a very good job portraying Asumi so far and I can’t wait just to see what plans will she come up with next. O_O looks like Nishikado found out her identity. He knew from the beginning when they met under the sakura tree. He asked her what’s her real plan in this hospital, until she changed her name? Is it to avenge her father’s death? I think I’ll review this drama from now. At first, I thought of doing this just for the first epi since it’s been a while since I do drama reviews. But this exceeded my expectation. It seems to be quite exciting and filled with suspense.